Bhuna Gosht literally translates to fried meat. One of the best ways to get the aromatic spices lend their flavour in meat dishes is to bhuno (fry) them. In north India, frying the masalas well, adding sprinkles of water so that they don’t get stuck to the bottom of the pan is done with almost every gravy dish made. My Nani (maternal grandmother) was known for frying the masalas for more than half an hour just to get the gravy right, small wonder she was the best cook in our family. Gosht is Persian for meat or flesh, which has been adopted by other South Asian languages. Gosht is an essential part of Pakistani cuisine, which features many meat-based gravies. A wide variety of meats are used in Pakistan. In India, gosht dishes are likely to be made with goat or mutton. In India the term “mutton” is more likely to mean goat rather than adult sheep, as it does elsewhere in the English-speaking world. As the Hindu religion prohibits eating beef, and Islam prohibits the eating of pork, Indian gosht is not traditionally made with these meats. When Indian dishes are translated and adapted for Western diners, lamb is the meat most often used in the adaptation. This has led to a common misconception that gosht means “lamb”. Variations include bhuna ghosht, kadhai gosht, raan gosht, dal gosht, nihari gosht, rara Gosht, and saag gosht, which includes spinach. Karahi gosht is cooked in a traditional cooking pot from which it takes its name. Heat the oil and add onions, ginger and garlic. Fry till the raw smell goes away and onions turn translucent. Add turmeric powder, cumin powder, chilli powder and coriander powder. Stir fry for a few seconds. Now this is the tricky step. Add the meat, turn the heat to high and fry for about 5-7 minutes to seal it. Reduce heat and fry for 5 more minutes constantly stirring. Cover the pan and fry for about 10 minutes more stirring occasionally to ensure masala does not burn. The water of the meat would have evaporated by now and you will see the oil separated, floating on the meat. Fry for a few more minutes till the meat becomes nice, evenly brown. Keep sprinkling water and scraping the masalas from the bottom else the they will burn and the dish will loose it's flavour. The meat will look fairly dry and well coated with masalas at the end of the process. Add the chopped tomatoes, garam masala, warm water, salt and simmer the meat for 30 minutes (or till done). Alternatively, I use the pressure cooker on low heat for anything between 15 to 25 minutes depending on the type and tenderness of meat. When the meat is cooked, dry off the excess water, a thick spice paste should be clinging to the well browned, tender, juicy pieces of meat. 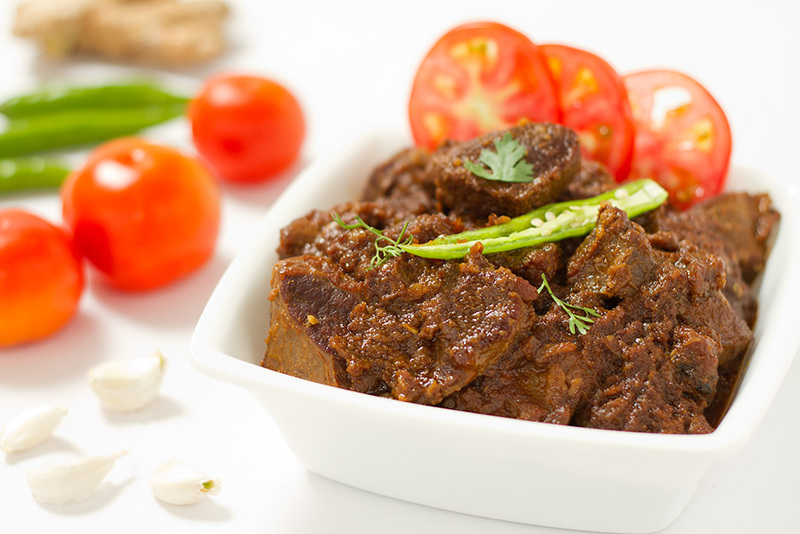 Serve the bhuna gosht by garnishing it with slice of tomatoes, green chillies and green coriander. Tried this recipe after Easter as I had some mutton left over that I hadn’t used. Super delicious. The kids loved it. Thanks Swati. hi, been coming to this site via Suresh (Subramanian). have cooked a couple of dishes which did come out well, the latest being mutton lazeez 🙂 was thinking of cooking the bhuna gosht today. a doubt. while the ingredients don’t mention onion, step 2 says we we should fry the onion etc in oil. so how many onions? about 3/4? Thanks for visiting and cooking my recipes. Apologies for the mistake in ingredients list. Have edited and corrected it. You will need 3-4 large onions, finely chopped for this recipe.